The ridiculous spoiling of my grandmother continues. 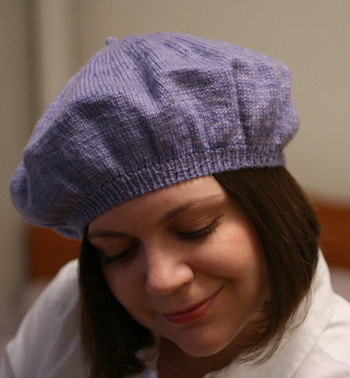 Pattern: simple beret, embellished with a little nubbin. Details extracted from a variety of sources (Kate Gilbert’s Speckled Beret, Ann Budd’s The Knitter’s Handy Book of Patterns , Charlene Schurch’s Hats On! , research at local department stores), then chewed up and spit out by yours truly. Needles: no less than a full menagerie of US 1 and US 2 knitting implements (Boye steel crochet hook, size 2; Susan Bates dpns, US 1 and US 2 ; Inox aluminum 16″ circs, US 1 and US 2; HiyaHiya 24″ circs, US 2). 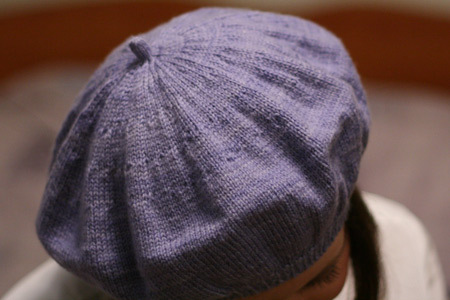 Yarn: Lorna’s Laces Shepherd Sport in periwinkle, 1 skein (in its glorious entirety). Gauge: about 7 stitches and 10 rows per inch. Finished dimensions: about 11″ in diameter. Lorna’s Laces continues to meet and surpass my expectations – what other yarn can be entangled in mohair, knit and reknit, and still come out as good as new at the end? Plus, the semi-solid colorways are simply amazing for the kind of knitting I typically do. I am hoping the beret has just the right volume and drape for my grandma. I definitely can’t envision my grandma liking a stiff fold line, which is why I didn’t block over a plate. Last, I threaded 2 strands of thin elastic close to the cast-on to keep the beret firmly on the head. I think it makes a huge difference, functionally speaking, without altering the outside at all. Although obtaining the proper beret shape and size proved to be tricky, I’m so glad I didn’t stop until it was perfect. When it comes to my grandma, “good enough” simply won’t do. I will revisit this entry every time I contemplate ripping and reknitting – sometimes the end product is worth the pain of starting over. What a lucky grandma. And, best of all, she seems to know it. Beautiful work, as always. I’m in awe. bravo! it’s great-looking and grandma will know it. enjoy the gift-giving. I love your beret! But I love your search for perfection even more! Your grandmother will love it! I bet Grandma loves it. congrats- the beret looks fabulous! i’m very impressed by your perseverance. i’ve been reading your blog for a few months now (and did the requisite devouring of your archives in under a week) and i’m a hopeless lurker, but all that ripping and reknitting certainly merits a comment! thanks for the great reading! I hope Grandma reads your blog so she can see how much you love her. 4.5 attempts – sheesh! You’ve got more patience than I do, that’s for darn sure. Very cute! Well worth the effort! Well, if grandmas aren’t worth perfection, no one is. 4.5 times seems to be the charm on this lovely number. Good job. Good enough won’t do for my grandmother either. I figure once you are 80 (or so) you have earned certain priviledges. One is obviously have grandchildren knitting until perfect! It is gorgeous and I hope she loves it. Gorgeous! I just love the colour, and it is such a stylish looking beret for the modern gal, whatever her age. I look forward to the pattern! beautiful beret! i love it. very stylish and she’s going to love it. Thanks for showing the woven-in elastic; I’d been wondering about the best way to do such a thing, and your method looks very good. The beret looks lovely! I was trying to imagine you taking pictures of the top of your own head (while smiling) but decided you must have a partner in crime for such things. You’re grandma is going to be so stylin’ (as well as spoiled, as grandma’s should be). I see more 50 mm lens goodness. Beautiful job! Love the color. And after watching all your attempts with this project, I really want your camera. That’s normal, right? YAY!!! And I agree with your assessment of Lorna’s Laces. It’s superlative stuff. Really, your smile says it all. You got it perfect! Huzzah! It looks wonderful, and your grandma will love it. I think she’s very, very lucky to have such a loving and attentive granddaughter! I wish you would take a picture with your grandmother wearing the beret. She is fortunate to have a loving grandchild to knit things for her, but you are lucky to still have your grandmother. I miss mine terribly! Very cute! I’m sure your grandmother will love it — who wouldn’t? I love the shot of you with downcast eyes and that serene smile, compared to scrolling down to the one with the sad puppy eyes. One could do a whole photo essay based on those expressive eyes! Oh yeah, beret rocks, too. aww.. it came out so cute! your work is perfect, as always. Love it!!! Can’t wait for the pattern. I am presently knitting Le’ Slouch (a beret pattern written by Wendy Bernard). Glad you stuck with it. It really turned out lovely. It’s incredible! 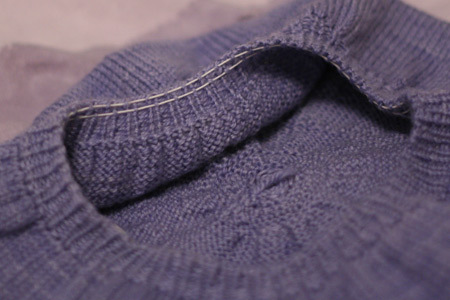 That periwinkle is just the right color to jazz up a grey winter day! it’s beautiful, and perfect. And your grandma deserves to be spoiled – I wish I still had one to spoil…. Not sure if somebody else mentioned this, but there is a book called “Knitted Tams” (I think this is the title) published by Interweave knits that has a whole thing on measuring, etc. Sorry I would have mentioned it earlier but I haven’t checked your blog in a while!! It suggests blocking using a plate!! Looks fabulous! Congratulations on finishing – finally! Superb! Your Gram will love it! Will await your tam pattern. Years ago my Mother made me an angora tam – she was from England – and I remember being the only girl wearing one -whether I wanted to or not! Memories…. Wonderful! Having just today pulled and re-knit only a single row on my current project 4 times, I can honestly say your perserverance is commendable. Your Gran is a lucky woman. Definitely keep spoiling her, Grandmas deserve it! Hey- it looks great! In case you are interested, I just got a book on tams from knitpicks, and it exhaustively goes through the process of making a tam and how to alter sizing, etc. Lovely! I’m glad you stuck with it! Brava!! It’s beautiful. I’m sure Grandma will lurve it! Very nice! Lorna’s laces is some tough yarn, I have noticed that it holds up well. Grandma is spoiled! Lucky lady! Stunning! You are amazing, grandma will love it. That’s what I call determination. I think I would have put that project in the box by now, but your grandmother sure seems worth all the effort. What’s next? Great job – well done on persisting! it’s beautiful! Great job spoiling your Grandma. Delurking to say that that is an awesome beret. Your grandma is a lucky lady. I do so hope you share the pattern with us. Beautiful as usual. Another great gift for grandma. I believe a standing ovation is in order. Well worth it, I’d say. Very cute! Grandmas should be spoiled. Beautiful. And I agree with Martha, Grandmas should definitely be spoiled as much as we can. This project is definitely a testament to the value of patience and persistence. Beautiful, I’m looking forward to your sharing the pattern that you’ve worked and worried so hard to create. From here, the end result looks well worth the effort. I’m sure your Grandma will appreciate the love that has gone into this project. Lovely! And all the slogging through makes it even more special. Grandmas do deserve all the spoiling we can give them. It did come out perfect. Your Grandma will love it. Lovely beret, lucky grandma! Lorna’s Laces is fantastic, although the variegated colourways are evil pooling temptresses! You did it! Grandma is a very lucky lady. I can really appreciate how persistant you are, now that I know what size needles you used! WOW! A whole hat 4.5 times on wee little sock needles! Perfect!! I’m beginning to feel guilty for not knitting for my grandma…then again, I have 3 daughters to knit for! Your work is always so beautiful! You have a pattern in Spring Interweave!!! How WONDERFUL! Congrats on that! it looks beautiful, and you look very pleased!! Oh, it is adorable! Great job! Has anyone taken a peek at Interweave knits upcoming issue….. 🙂 congratulations are in order – not just for persisting through the knitted beret project. Way to go! Awesome! Congrats on the roza’s socks! 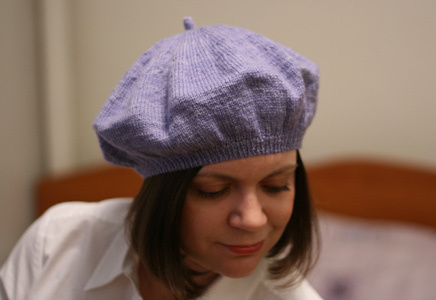 That is the most ridiculously Russian-granny-looking headgear I have ever seen on a knitblog. Congratulations on your sock pattern in the Spring Interweave!! Looking forward to a new super pattern. Are these socks you made for your Grandma? I do hope you share with her your pattern being published – she will burst with pride! I just saw the IK preview too! I’m buying a copy just for the sock pattern! I already have some Shepherd Sock in stash for it. Congratulations! WOW – just saw you in Spring Interweave Knits!! Can’t wait to see those socks up close and personal….The beret is beautiful! It’s a beauty – right down to the little nubbin! Absolutely perfect, and thank you so much for sharing all of this with us mortals. We are inspired to continue to excel even when we would like to throw some horid work at a wall. You are the queen of doing it right. Can’t wait to see those IK socks in closer detail! Lovely and grandma deserves a little spoiling! Your tenacity is definitely inspiring. And those modeling shots are lovely! Grandma will certainly love this beret. Very nice! It’s a really cute hat. I like the socks too! What a great idea to name them after one’s grandmother. Did you see the latest KnitPicks catalog? Some wonderful Tam patterns. All that hard work paid off. I can’t wait to see the pattern eventually!! Great idea with the elastic too. Bon Jour! It looks fantastic! I wish I had a grandma to spoil! I love the periwinkle colour. My older daughter looks fabulous in it. I am thinking a lot about tams now too. There are so many construction techniques, including flat! Yours is a work of art.